Known for his military prowess as well as his gift in music (1 Sam 16:17-18; Amos 6:5) and poetry (2 Sam 1:17-27), David is seen as one of Israel's greatest kings. Attributed as the author of 78 psalms, David is mentioned some 1135 times in the Bible. Completing the conquest of Canaan initiated by Joshua and securing the borders of Israel (1 Sam 30:17; 2 Sam 5:17-25; 8:1-14; 10:6-19; 12:19-31), David established Jerusalem as the capital (2 Sam 5:1-12; 1 Chron 4:1-9) of his monarchy (1000-962 B.C.). Of significance is the establishment of the Ark of the Covenant in Jerusalem (2 Sam. 6:17-20; 1 Chron 15:1-29; 16:1-3; 2 Chron 1:4), because for the first time, Israel's political and religious life is centered in one place. David makes Jerusalem becomes an important capital, not only for government, but as the place to worship God. And God establishes His covenant with David (2 Sam 8:8-17; 1 Chron 17:8-15) including the promise that He would make David's name great (2 Sam 8:9). Recognizing Jesus as a descendant of David (Matt 1:1-18; Luke 3:23-38), people called Him the "son of David" (Matt 9:27; 15:22; 20:30-31; 21:9, 15; 22:42; Mark 10:47-48; Luke 18:38-39). Against this biblical backdrop, as late as 1993, there was no archeological evidence confirming (or denying) the existence of king David, and there was considerable skepticism whether he really existed. At an excavation of Tel Dan led by Israeli archeologist Avraham Biran in northern Israel, a small broken stone slab was discovered. Believed to be part of a victory stela, this ninth century B.C. 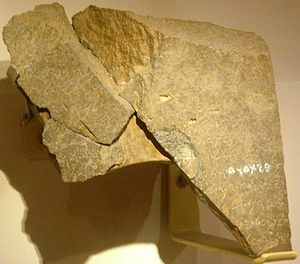 fragment mentioned the reign of king David and became known as the Tel Dan Inscription which provided the first historical evidence of David's existence. More than a century after his death, Israel's enemy still recognized David as the founder of the kingdom of Judah. 1. Schoville KN, "Top Ten Archaeological Discoveries of the Twentieth Century Relating to the Biblical World" in Stone Campbell Journal, vol 4, no. 1, Cincinnati: Stone-Campbell International, (2001).